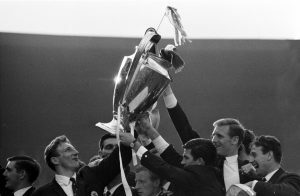 Celtic’s most historic season started with a clean sweep of all the domestic titles and culminated in European glory at the Estádio Nacional in Lisbon. The first piece of silverware of this extraordinary campaign came in the form of the Scottish League Cup with a 1-0 victory over Rangers at Hampden Park in October 1966 and a 4-0 win over Partick Thistle just over a week later brought the Glasgow Cup to Celtic Park. On 29th April 1967 the Celts triumphed in the Scottish Cup Final defeating Aberdeen by two goals to nil and a 2-2 draw with Rangers at Ibrox Park on 6th May secured the League Championship title. It was in Europe, however, where the club would make the biggest headlines. Victories over FC Zurich, FC Nantes, FK Vojvodina and Dukla Prague brought Celtic to their first ever European Cup Final. On 25th May 1967 the Lisbon Lions lined up against the much fancied Internazionale of Milan. Despite losing an early goal, Celtic’s attacking brand of football overcame the defensive ‘catenaccio’ tactics of the Italian giants and two second half goals from Tommy Gemmell and Stevie Chalmers gave Celtic a dramatic victory. In doing so the club became the first British team to win the European Cup.